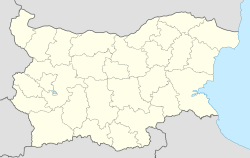 Smyadovo (Bulgarie: Смядово, pronounced [ˈsmjaduvu]; transliteratit Smjadovo or Smiadovo) is a toun in eastren Bulgarie, pairt o Shumen Province. It is the admeenistrative centre o the homonymous Smyadovo Municipality, which lees in the sootheastren pairt o the province. As o Dizember 2009, the toun haes a population o 4,036 inhabitants. Smyadovo lees in the sootheastren Danubian Plain, at the northren fuit o the eastren Balkan . It wis first mentioned in early Ottoman times (Evliya Çelebi mentions it as Smedovak) an wis proclaimit a toun in 1969. Smyadovo Cove in Rugged Island in the Sooth Shetland Islands, Antarcticae is namit efter Smyadovo. This page wis last eeditit on 11 Mairch 2018, at 03:15.